People who are thinking about buying, or have already bought, a home in a new subdivision usually have a list of questions about what they are able to do. Wondering if a subdivision has been assumed? Visit the assumption of subdivisions page to track the status of the assumption of a subdivision. A subdivision agreement or development agreement clearly states the developer's obligations to the municipality or region for construction of roads, sewers, watermains, parks, open spaces and other services in your subdivision. These are complex legal documents. Purchasers are urged to review these agreements with their solicitor, especially the warning clauses and special conditions, before signing the purchase documents. All Builder/Homeowner Purchase and Sale Agreements should include purchaser warning clauses that alert new homeowners of potential issues regarding their subdivision. Purchasers should carefully review these clauses. When in doubt, homeowners should contact the town's Development Engineering department for clarification at 905-845-6601, ext. 3040. 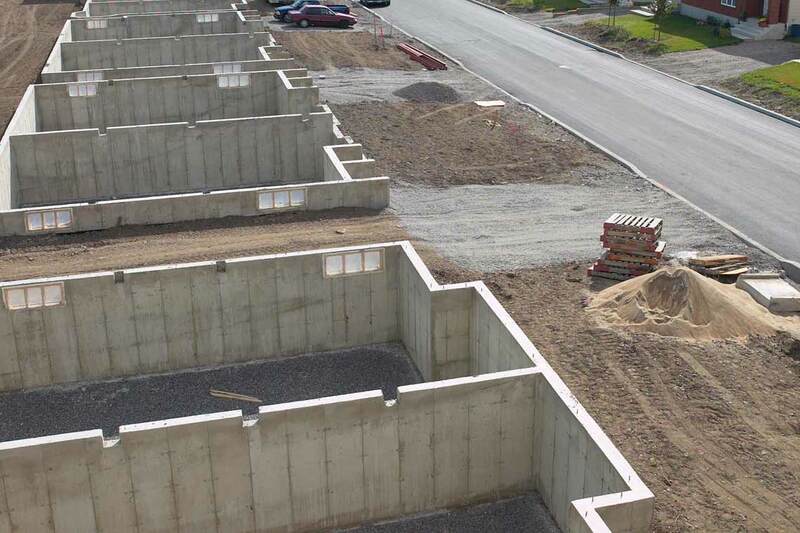 The developer is responsible for grading and drainage; construction of sewers, watermains, roads, curbs and sidewalks; street lighting and perimeter fencing in the subdivision. The builder is responsible for constructing your house, grading and sodding of the lot and driveway construction. Information regarding the placement of hydro boxes, sidewalks, community mailboxes, lampposts, etc. abutting your property may be obtained from either the developer or builder of your subdivision. This information is provided in the sales office as well as a Land Use signage within the subdivision. You can also contact the town's Development Engineering department at 905-845-6601, ext. 3343. When will the town plant trees on my street? When will the developer/builder install my fencing? Can I landscape or plant trees, shrubs, flowers or place structures on the town boulevard? Can I apply for a parking permit? How can I pay my parking fine? Who can I call about snow clearing in Oakville? When will garbage collection begin? Where can I get a blue box? Who is responsible for the cleaning mud/dirt off the roads? Final acceptance and/or assumption of a subdivision occurs when the municipality assumes responsibility for the maintenance of all municipal services from the developer. This typically occurs within three to six years after the registration of the subdivision, or when all the developer's requirements have been fulfilled. Until this happens, the developer is responsible for all municipal and regional services and maintenance of the streets with the exception of snow clearance and garbage pickup. Unassumed roads are open to the public and subject to conventional rules of the road under the Highway Traffic Act including parking regulations. Visit the assumption of subdivisions page to track the status of the assumption of your subdivision. A professional engineer working on behalf of the developer must certify the final grading of lots to ensure it meets the drainage plan approved by the municipality. This certification takes place after the property has been graded and sodded. Homeowners should not alter lot grading without permission from the developer. Please note that detrimental alterations without consent may result in costly expenses for the homeowner. Builders often require deposits before closing to ensure that new homeowners do not alter the grading of their lot before final certification. The town does not require the builder to take these deposits. The homeowner should check his or her Agreement of Purchase and Sale to determine when the builder will return the deposits. The Region of Halton is responsible for all services related to water and sanitary sewers (not storm sewers). However, the developer is responsible for construction and maintenance of water and wastewater services until the subdivision is assumed by the town and the region begins the provision of water and sanitary sewer services. For more information call AccessHalton at 905-825-6000 or visit the Region of Halton website. Do I need a building permit for a shed, deck, fence, pool, to finish my basement or to install an air conditioner? To determine if you require a building permit, please contact Building Services at 905-845-6601 ext. 7376. To ensure compliance with the town’s zoning by-law, please call 905-845-6601 ext. 3036, 3174 or 3361. In addition to a building permit, a Site Alteration Permit or a Pool Enclosure Permit may be required. For these permits please contact ServiceOakville at 905-845-6601. If you require a building permit and zoning compliance please contact Building Services at 905-845-6601, ext. 7376. To learn more visit the Construction Projects and Renovations page. In most instances, you will require approval from the builder, since fencing, pools and other works alter grading or landscape work on your property. Builders can require that homeowners dismantle fences, decks, sheds, etc. if necessary to complete their work. Do not landscape, erect fencing, decks or sheds or install a pool that may alter the grading and/or drainage on your lot, or that of a neighbouring lot. Any alterations to grade must conform to the requirements of the municipality and pose no impact to the overall drainage patterns in the area. For more information please call 905-845-6601. To learn more visit the Construction Projects and Renovations page. Every builder will have rules regarding pool installations. Homeowners are advised to read their home purchase agreements. Until the subdivision is assumed by the municipality, the developer is responsible for all lot grading and drainage. The installation of a pool may result in changes to the grading or drainage. Should the developer and builder agree to a pool structure, authorization from the town is required. As part of the town's pool enclosure by-law, homeowners are required to apply for a permit to construct a pool and safely secure the property with appropriate fencing, gates and separation distances. If your subdivision has yet to be assumed by the town, a pool enclosure permit cannot be issued without the written consent of your developer. For more information please call 905-845-6601. A permit is required if access to town land is needed. For more information call 905-845-6601, ext. 3076. To learn more visit the Home and Property Projects - Pool and Hot Tubs page. When will street trees be planted on my street? In new subdivisions in Oakville the developer is responsible for the installation of street trees and the species and location are determined in consultation with town. Planting takes place in the spring and fall of each year after the sod is laid by the builder. The spacing and location of the trees varies and not every lot will receive a municipal street tree. The town is responsible for choosing the species of tree to ensure longevity. All streetscape designs are approved by Council. For more information, please call 905-6601, ext. 3869. Sodding of your lot will normally be carried out months after construction to allow for settling. It may also be delayed after occupancy of your home due to seasonal availability of sod. Contact your builder to find out when exterior work will be finished. Municipal consent to occupy the home will be granted as soon as safety and basic service requirements are met, however, this does not guarantee that the home will be completed to the homeowner's satisfaction. For example, the municipality will grant occupancy when one toilet and one sink are installed and operational, regardless of the number of washrooms included in the house plans. Purchasers are urged to review completion issues with their solicitors. Developers are usually responsible for fencing on the subdivision, such as acoustical fencing, corner lot screen fencing or chain link fencing adjacent to open space and/or parks. Homeowners should contact their developer or builder to find out when fencing will be completed. Can I landscape or plant trees, shrubs, flowers or place structures on town boulevards? Vegetation and/or landscaping features cannot be placed on town lands. Homeowners who do not comply will be required to remove these features at their own expense. For more information please contact the town's Road Corridor Permit Coordinator at 905-845-6601, ext. 3337. Homeowners or purchasers should contact their builder for specific plans and drawings. The municipality may have drawings on file as part of the building permit process. Copies of these drawings may be obtained through freedom of information and duplicated for a small fee by contacting Building Services at 905-845-6601, ext. 7376. Most new subdivisions include a stormwater management facility, which often appear as a landscaped pond. These ponds are designed to collect runoff after a heavy rainfall, treat and discharge it into rivers and creeks. Ponds are monitored and maintained by the developer, including routine dredging of the area, until the municipality assumes the subdivision (up to 10 years after construction). Driveway construction within the public road allowance is the responsibility of the developer. The standard in Oakville is for concrete driveway aprons. It is often recommended that paving a driveway be delayed, so that natural settlement can occur. Always refer to your Agreement of Purchase and Sale with regard to construction responsibility and timing of completion. If you want to widen your driveway contact the Zoning section at ext. 7376 to ensure that the widening is in compliance with town by-laws. Contact the town’s Road Corridor Permit Coordinator at 905-845-6601, ext. 3337 if you want to widen the curb cut. If your subdivision is yet to be assumed by the town, you must also obtain your developer’s permission to widen or do any alteration to your driveway. To learn more visit the Zoning page. The side of the street designated for parking is determined early in the subdivision design process. Unless otherwise signed, there is a three-hour parking limit in effect on all town streets. Between November 15 and April 15, parking is prohibited on all streets between 2 and 6 a.m. to facilitate winter road maintenance. Temporary on-street parking permits are available for overnight visitors, driveway repairs, etc. For more information contact ServiceOakville at 905-845-6601. For one-night of unplanned overnight on-street parking, please use the after-hours messaging service by calling 905-845-6601. Be sure to record your address, licence number and make of your car. Oakville parking tickets can be paid online. Who do I contact about public transit service? Potential bus routes are identified early in the subdivision planning phase. Bus stops and/or shelters are identified after a route has been introduced to an area. The majority of construction must be complete in a new subdivision before allowing buses access and is also subject to demand and funding. Service is generally introduced as rush-hour only service, and in time develops into all-day service. Please visit the Oakville Transit website for current routes and schedules. These fences are located on town property and were installed by the developer to separate your property and protect public areas such as parks, walkways, natural areas and storm water management ponds. Gate access into these areas is based on Council-approved policy. Call 905-845-6601, ext. 3076 for details. Winter control (plowing, salting/sanding) services for roads and sidewalks are provided by the town's Roads and Works Operations department. Please call 905-845-6601 during regular business hours (8:30 a.m. to 4:30 p.m.), Monday to Friday. For after-hours or weekends, please call the Snow Information Line at 905-815-5999. Please refer to the appropriate education board for information regarding schools and busing. School locations and potential sites are determined by each school board. Future schools identified on maps or signs in subdivisions are not guaranteed to be built. Should the boards declare any site surplus, the lands can be developed for other purposes depending on the zoning of the lands. Your builder is responsible for any deficiencies in your new home. First, give your builder a chance to act on your complaints. Then, if the builder fails to respond, notify TARION (formerly Ontario New Home Warranty Program) and request assistance within the proper timeframe of your warranty. It is important to record all complaints in writing to both your builder and TARION. For more information contact the offices of TARION at 1-800-668-0124, visit the TARION website or email info@tarion.com. Please note there are strict time limits in which written complaints must be made to TARION. Purchasers are urged to discuss the complaint process with their solicitor. All waste collection and recycling services are managed by the Region of Halton. As a new resident, you will receive a free blue box. For information regarding waste collection and recycling in new residential areas, please call AccessHalton at 905-825-6000. Zoning regulations govern the location of external equipment. As regulations vary by zone, owners should check with the zoning section of the Building Services department to determine what regulations are applicable to their location. Please call 905-845-6601, ext. 7376 for details. To learn more visit the Zoning page. All new subdivisions have nuisances pertaining to noise, truck traffic, dust and debris. While these are an annoyance to homeowners, the town does require the developer/builder to mitigate these nuisances and work to reduce them when possible. Concerns can be directed to the ServiceOakville at 905-845-6601. The developer is responsible for maintaining clean and safe roads throughout construction. Please call 905-845-6601. Supplementary and/or omitted tax bills are additional bills issued by the town and reflect any increase in taxes resulting from additions or improvements to your property. Owners of newly constructed homes may initially be assessed for the value of land only, however, following possession they are responsible for full taxes (land and building) from the date of possession forward. Though it can take up to two years to determine your home's assessed value, Municipal Property Assessment Corporation (MPAC) will issue a supplementary assessment notice, and in turn, the town will issue your tax bill, which is retroactive to the possession date. For more information, please call the town's Tax Inquiry Line at 905-338-4222.